On its face, this movie might seem to be just another movie about a lonely teen with a crush (Can't Hardly Wait, A Walk to Remember, Can't Buy Me Love, shall I go on?). But this isn't your average bubblegum movie with a Top 40 soundtrack. For one thing, the music in this movie is awesome. The characters in the movie are actually sort of obnoxious hipsters who can't stop talking about their love of "good music" (wtf does that mean anyway?? ), but the music they play throughout the movie is actually good, so I guess they have a reason to act so superior. Oh, except when they've never heard David Bowie's song Heroes before (Uh, Moulin Rouge anyone?). For supposed music fans, I find it difficult to believe they've never heard this song. That's like being an art snob and not knowing all the works of Warhol or something. 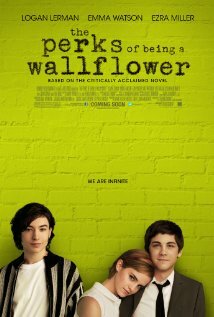 The slightly disjointed part of the movie is the fact that all the characters are supposed to be in high school. Of course, we should all be used to teenagers acting like 25 year-olds on screen with shows like Gossip Girl, but I have to admit there were times when I had to smack my head like, really?? For instance, there is a Christmas party/gift exchange in which the gifts are nicer and more expensive than gifts I buy now, as an adult. Maybe I'm just cheap, but I have a hard time believing that seventeen year-olds buy suits for each others. Also bugging? Emma Watson. I love her, of course, like any good Harry Potter fan, but this haircut and her American accent do her no favors here. So the movie isn't perfect. And I realize from the number of criticisms I listed, it seems like it has a lot of flaws. But it is both funny and sad at the same time, which is always difficult to pull off. And I found it easy to relate to the characters, which makes you invested in what happens to them. The best part of the movie, though, is how it all comes together in the end. It's very cleverly written to allude to a number of problems underneath the surface without actually telling you what they are, so when you finally figure it out, you feel so proud of yourself. An "aha" moment of sorts. It's the little things in life, people.